Cauliflower (Brassica oleracea botrytis) is a cole crop very closely related to the cabbage. It is a variety of the same species, both having originated, probably as mutants, from the same wildcabbage ancestor. The cabbage head is a bud, but that of cauliflower consists of fleshy peduncles, pedicels, and other flower parts subtended by a number of cabbage-like leaves. Cauliflower does not thrive in hot, dry weather and consequently is grown either as an early or late crop. 63 It is not as hardy, can stand less heat, and is much more exacting as to climate than cabbage. Hence, on a large scale it is grown only in a relatively few restricted areas in the United States. Seedlings of the Early Snowball variety were transplanted into the experimental field at Norman, Okla., Apr. 19. The plants, which were in the third- to fourth-leaf stage of development, were set in rows 2.5 feet apart and 3 feet distant. Early Development.--The first root excavations were made May 10. The plants had made a vigorous growth. There were 6 to 8 leaves, 3 to 4 inches long, per plant. The taproot, as usual, had been broken in transplanting. The root system consisted of a large number of delicate white roots less than 1 millimeter in diameter. As shown in Fig. 35, many of these ran horizontally just beneath the soil surface, some to a distance of 15 inches. Others ran outward and downward and still others descended almost vertically. The greatest depth was 15 inches. Laterals 2 to 4 inches long had grown from the older parts of the largest roots at the rate of 8 to 16 per inch. Some of these gave rise to short sublaterals. A similar branching rate was evident throughout the plant, but tertiary branches had not yet been formed on most of the rootlets. The thorough occupancy of the surface soil was possible because of very shallow cultivation. Fig. 35.--Root system of Early Snowball cauliflower 3 weeks after transplanting into the garden. Note the fibrous roots near the soil surface. 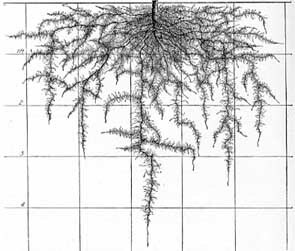 Typical plants had 6 to 10 main roots which were 1 to 3 millimeters in diameter. Due to frequent branching they tapered rapidly so that 18 inches from their origin they seldom exceeded 1 millimeter in thickness. Some extended widely in the surface foot of soil, others penetrated almost vertically downward, and still others pursued an intermediate course. 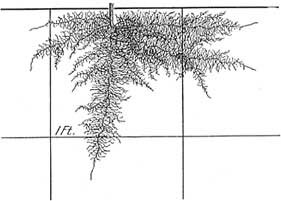 Hence, the general shape of the root system was that of an inverted cone with a diameter of about 2 feet at the base and a depth of 2.5 feet (Fig. 36). All of the roots were profusely branched with both long and short laterals. The larger ones were usually 5 to 9 inches in length but a few 15 inches long occurred. Near the base of the plant and especially on the larger branches rootlets, often 4 to 10, grew in clusters. These root clusters were very numerous, frequently 12 to 15 occurring per inch of main root. The rate of branching elsewhere was about 16 laterals per inch. Thus the soil volume was exceedingly well ramified by an extensive network of delicate, white rootlets. Fig. 36.--Cauliflower 8 weeks after transplanting into the garden. Maturing Plants.--When the cauliflower was suitable for table use, July 19, further examination of the root system was made. The plants were 2 feet high and had a spread of tops of 2.5 feet. 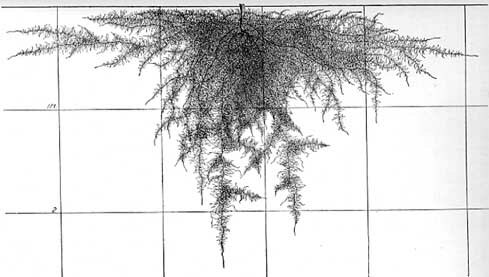 A typical root system had 17 strong branches 3 to 10 millimeters in diameter. Few of them gave rise to major laterals until they had reached a distance of 6 to 12 inches from the base of the plant. Thereafter they branched repeatedly as shown in Fig. 37. The general shape of the root system had not been greatly changed except that a much larger soil volume in the second foot was now occupied. In this soil layer the lateral spread had been extended from about 8 inches (June 15) to 2 feet. Fig. 37.--One-half of the root system of cauliflower (July 19) at the time the plants were suitable for table use. The third foot of soil was also moderately well ramified, the deepest root, which had apparently replaced the taproot, reached the 54-inch level. The soil was also well occupied by rootlets near the surface. A lateral spread of 2.5 feet was found. Branching was even more profuse throughout the whole volume of moist, mellow soil than at the preceding examination. In fact, it is quite impossible to show the complete degree of branching in the most carefully executed drawing. Summary.--Cauliflower, like cabbage, is characterized by a taproot which is usually injured in transplanting. Numerous, large, exceedingly well-rebranched laterals and a very profuse network of smaller ones occupy a large soil volume. Early in the development of cauliflower the soil from the surface to a depth of 8 to 12 inches is filled with fine roots throughout a zone with a radius of 1.5 to 2 feet. The 2 feet of soil beneath the plant is likewise well ramified. The widely spreading, main laterals finally turn downward. With their profuse network of branches, aided by those of more obliquely penetrating laterals, they thoroughly ramify the first 2 to 3 feet of soil throughout a territory extending 2 to 2.5 feet on all sides of the plant. The deeper soil to 4 feet is less fully occupied by vertically descending roots or branches. As a whole the root system even more thoroughly fills the soil than does that of cabbage. Root Habits in Relation to Cultural Practice.--The root systems of cauliflower and cabbage have many similarities and the method of planting and growing cauliflower is very much the same as for cabbage. Climate is a more important factor than soil; the vigorous and extensive root system develops well in nearly all kinds of soil. Growth is promoted by thorough soil preparation and the liberal application of manure or other fertilizers. A constant supply of moisture for the roots should be maintained so that growth of the plants is never checked. This may be promoted by frequent tillage. Cultivation, as for cabbage, should be shallow. Because of the thorough occupancy of the surface-soil layers by the maturing root system, it would seem that, as in the case of cabbage, late cultivation might do more harm than good. All of the soil between rows spaced 2.5 to 3.5 feet apart is thoroughly occupied.